It’s been quite a day. Sure, the snowfizzle meant we all had to work today, which was a bummer, but at least we didn’t have to dig ourselves out again, right? Below, we’ve got the Metro map in abbreviations, a fight between Streetcars and Monorails, the D.C. Preservation League (aw, you were hoping for Justice League. Me too.) and the Censored Art Museum. The City Paper’s Alex Baca has the story of the Museum of Censored Art’s trailer coming to sit right outside the National Portrait Gallery tomorrow so that you can see A Fire in My Belly, which was ousted from the Museum in a rare show of censorship by the Smithsonian. They’ll be there every day from tomorrow until February 13th. If you haven’t seen DC Central Kitchen’s bill of volunteer rights, give it a look. If you think Metro station names are a bit long, then have a look at GGW’s Metro Station Codes Map, which would tell you that a commute of LND to IKE is a pretty long ride, but that RLN to FSW is an easy one. Personally, I ride from BKD to NAV a lot in the summertime. 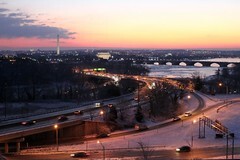 DCist has the word that the D.C. Preservation League is opening nominations for places to be protected in the new year. The Deadline is February 21, so get your thinking caps on, and find a place you love to save. Lastly, Slate has a blast-to-the-future-but-also-the-past look at Streetcars and Monorails. Must-read stuff if you’re for or against DC’s coming system.